While fending off America's accusations that it backdoors its gear for Beijing, Huawei has upgraded its FusionStorage software to v8.0 in hope of providing all the different storage resources a data centre needs from one silo. 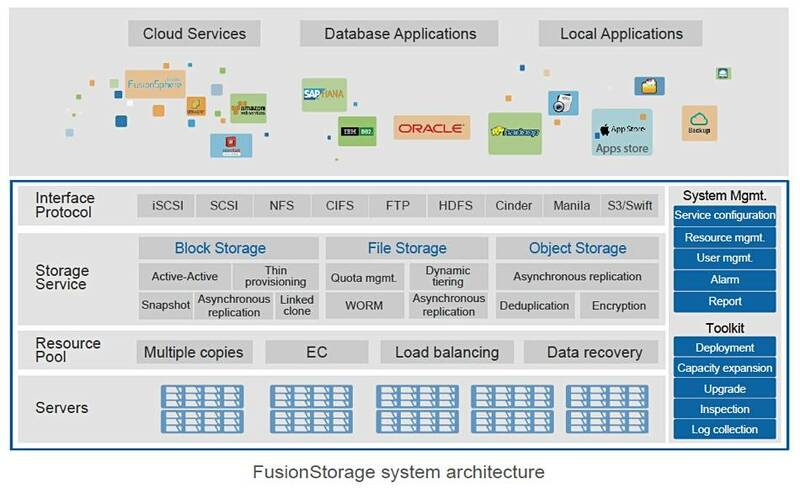 FusionStorage is a scale-out, distributed system which integrates the local storage resources of up to 4,096 x86 servers into distributed storage pools, to provide multi-protocol resources to applications. It claims six "nines" reliability; 99.9999 per cent, self-adaptive deduplication and compression capabilities, asynchronous replication technology and a latency as low as 0.5 milliseconds. Huawei reckons customers want a single storage resource covering all their storage needs, from background applications to mission-critical applications. It claims v8.0 is the first distributed storage system in the industry to support critical enterprise workloads and achieve a "one data center, one storage" goal. Support of both core and emerging enterprise applications. Data lifecycle management from generation, usage, and management, to backup and archiving. Integration of edge, private, and public clouds on one platform. One-stop deployment through converged protocols. Huawei says the Internet of Things (IoT), 5G, cloud, artificial intelligence, and other technologies pose scalability and management challenges to traditional centralised storage with silo-like deployment. It would have you understand FusionStorage unifies these silos and is the Lord of the enterprise data centre Storage Rings.